Uganda is an amazing country that has a lot to offer when it comes to adventure. The Pearl of Africa as popularly known, Uganda is a landlocked country situated in East Africa. This wonderful East African country is widely known as – the home of the rare mountain gorillas is bordered by five countries; Sudan in the North, the Democratic Republic of Congo in the West, Tanzania in the South, Rwanda in the South East, and Kenya in the East. Gorilla tracking in Uganda is one of Uganda’s major tourist attractions is the endangered mountain gorilla, the most profoundly built of living primates and among the most peaceable to be close. 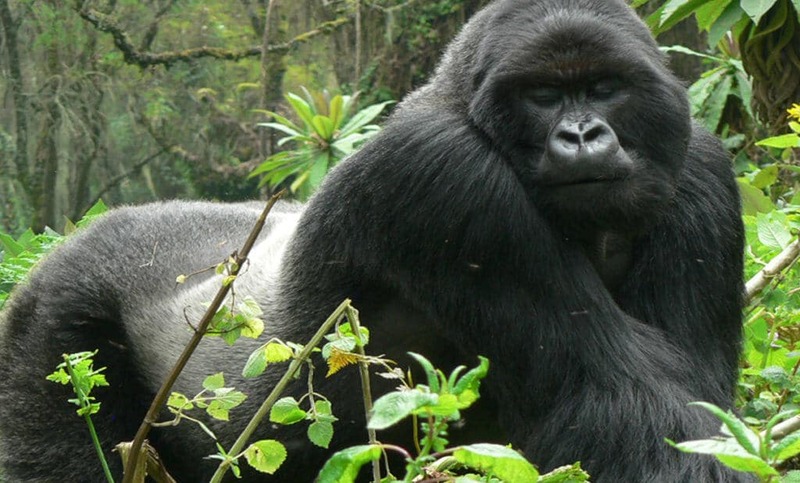 The most spectacular feature and profound pride within Uganda’s tourism industry and a rich biodiversity are the five habituated mountain gorilla troops – four in Bwindi Impenetrable National Park and one in Mgahinga Gorilla National Park, bordering the Democratic Republic of Congo and Rwanda. The groups are divided between Bwindi Impenetrable National Park and the Virunga Mountains south-west of Congo border. The groups have been given local titles which have very interesting meanings. Eight people are permitted per group per day and a total of twenty-four people are taken in Bwindi, while eight people are allowed for Mgahinga. Staring into the pondering brown eyes of these calm giants, who share 95% of their genes with humans, is as awe-inspiring as it is exhilarating; no less so, when one realizes that fewer than 700 known individuals survive today. Tracking Gorillas is one of the most immensely fascinating experiences for many taking wildlife safaris in Uganda. It is a fun filling lifetime ambition in the country’s national parks. The most celebrated destination for gorilla tracking in Uganda is Bwindi Impenetrable forest. The best way for a perfect tracking is guided nature walks between Buhoma in the Bwindi Impenetrable Forest and the town of Kisoro via Nkuringo and vice versa. This experience offers a low-cost insiders perspective into village life in rural Uganda highlighting some of the wonders of Bwindi Impenetrable Forest all at your own pace. Trails in Bwindi commence at 09:00 and 14:15 daily. Access: 6 hours drive from Kampala to Kabale. Kabale to Buhoma takes about 3 hours. You may travel by public mean although it is not a very reliable means. The drives may require 4WD vehicles. Accommodation: Clean and luxury camp bandas are available at Buhoma. There are three privately managed campsites in the area plus some up-market tented camps. It is paramount to know that the Uganda wildlife authority (UWA) requires you to have a permit for gorilla tracking in Uganda; Booking for all gorilla permits in Bwindi and Mgahinga is done at UWA Headquarters in Kampala. UWA is the statutory custodians of the country’s wildlife resources including the mountain gorillas with the task to conserve and sustainably manage the wildlife and protected areas in partnership with neighboring communities and several Uganda tour operators and safari agents. Advance permits are available as early as two years. Much as gorilla tracking in Uganda is a very captivating activity; it involves walking in the wilderness in search of these great apes. It can be a teasing experience, therefore ensure physical fitness. Uganda is also home to man’s closest relative, the chimpanzee, a delightful ape whose evocative pant-hoot call is a definitive sound of the African rainforest. Chimpanzee communities have been habituated for tourism at Kibale Forest, Budongo Forest and Queen Elizabeth National Park‘s Kyambura Gorge. The way they feed, climb trees, respond to humans and the care they show for their young ones, is just phenomenal. There is also a community of orphaned chimps, most of which were confiscated from poachers, and can be visited on Ngamba Island, which lies on Lake Victoria 45 minutes by motorboat from Entebbe. Of more exhalation is the extraordinarily perfect account of monkeys in Uganda. Kibale Forest boasts the greatest primate variety with five or six species likely to be observed on nature walk. Mgahinga National Park hosts habituated troops of the rare golden monkey, while Murchison Falls is one of the few East African strongholds for the spindly, plains-dwelling Patas monkey.